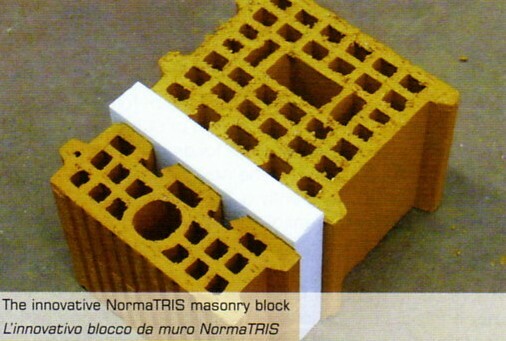 FORNACI DI MASSERANO AND HEAT INSULATION One of the few companies in Italy not to be adversely affected by the Decree Law 192/2005 was Fornaci di Masserano Bruno Tarello, a dynamic Piedmont-based company that had had the foresight to introduce its TRIS series load bearing wall blocks onto the market as early as 1994, followed in March 2009 by the new infill block line designed to meet the requirements of the new technical standards on seismic design.For the shaping of its products, Fornaci di Masserano has chosen extrusion equipment supplied by TECNOFILIERE, which allow for excellent use and flexibility in terms of the geometries that will become necessary over the coming years. TECNOFILIERE dies are much simpler to calibrate due to the external braking system. Furthermore, the slower movement of the clay allows for greater re-compaction subsequent to cutting and reduces overall wear on the die.